An EDC knife is what we should always carry on our side. It helps us deal with unexpected problems like when we need to cut a rope but there is no scissor. But with some people, a folding knife just doesn’t have the chance to show off. SO, many of us want to save money on this stuff, and an EDC knife under $50 is the ideal choice. It saves your money while becomes a reliable tool when you need it. Each one in our picks has its own strength and effectiveness to serve most kinds of user. Let’s find out some best EDC knives under 50$ with Shooting Mystery. 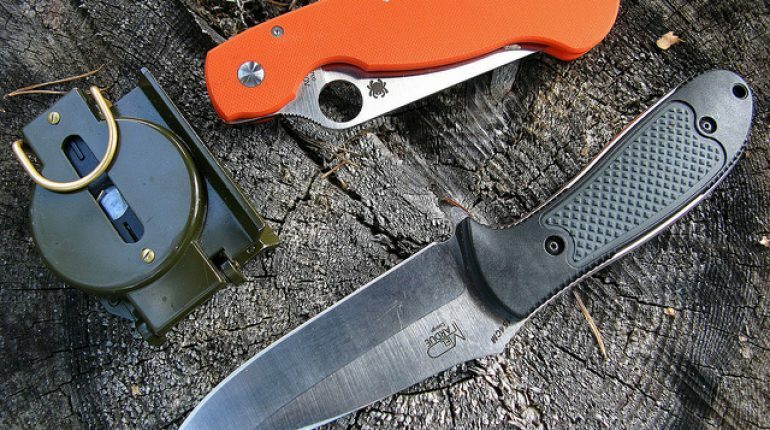 What is an EDC knife and why we need one? What to consider when choosing a best EDC knife under ? This knife has an amazing level of security as a cheap EDC knife. The blade will be locked in opened position by the liner. This increases blade’s strength and reliability. You can easily open it by pressing the thumb stud, but need more effort to return it to the handle. You must simultaneously move the liner outward and pull the extra safety lock to close the blade. No unintentional disengage anymore. The performance of SOG Assisted Technology is also impressive. You can open the blade with just one hand and the process is very smooth. The blade which is satin finished is tough, durable, and corrosion resistant. This is a pocket knife under $50 that you can buy in this 2017. The knife is made with the trademark 420HC steel of Buck Knives. The steel has high carbon content and is heat-treated well under Buck Knives enthusiastic forger’s hands. Thus, it has an incredible sharpness and durability, as well as corrosion resistant and edge retention. It easily accomplishes any cutting tasks for a standard EDC knife. A bolster connects the blade and handle, increases reliability and weight balance for the knife. 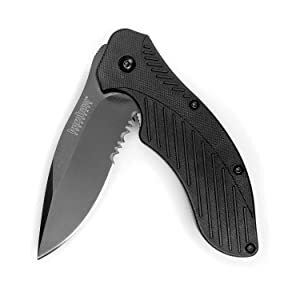 Thus, you will find it more comfortable when holding or performing heavy duties, with no doubt, this is truly a best EDC knife under $50. The blade is made of stainless steel, so it’s very sharp and tough. It tapers into a solid drop point tip, increasing penetration of the knife. Additionally, part of the blade has serration for cutting. Hence, this knife performs extremely well at cutting, stabbing, or carving tasks. 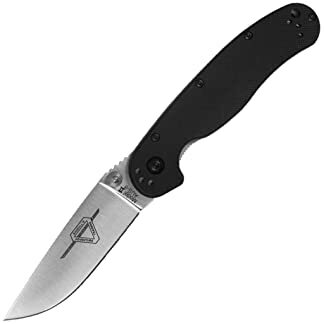 You can use this compact folding knife to do things that only a medium-sized fixed-blade Mora knife can do. SpeedSafe technology helps you open the blade quickly but securely. And the ergonomic handle with anti-slipping patterns provides controlled and comfortable handling. Another great product from Kershaw knives. Using 8Cr13MoV, the blade has a high level of sharpness, toughness, and reliability. It is resistant to stains, rust, or any kind of oxidization. It also has a penetrative drop point tip as the previous product. But its grip design is more impressive. With G10 scale in the front and 410 steel scale in the back, the handle is both solid and comfortable. It embraces the user’s hands, two traction are for anti-slipping and controlled handling. Both the blade and handle have stonewashed finish, which blurs and hide scratches. Your knife will stay good and efficient over a long time. If you are looking for a best EDC knife under $50, you can’t miss this one. The first impression of the knife is its ergonomic grip. The convex and concave fits many hand sizes and structures. Your thumb and index finger will put in traction, help you hold the knife firmly and comfortably. A liner lock mechanism keeps the blade in opened position, provides more security and power. The blade is satin finished and has a grind edge. It reduces forces needed when you cut something, thus improves cutting performance. With a reversible pocket clip, you can hang the knife either on the left or right side. Also, it can be used by both left- or right-handed users. With less than $50, no one can pass this tool as a pocket knife. This knife has amazing toughness, sharpness and edge retention. It’s because of the 420HC steel is effectively heat-treated. The blade is resistant to rust, dirt, and stains. It is easy-to-clean and stays beautiful as always. You can swiftly release a blade with just one hand. 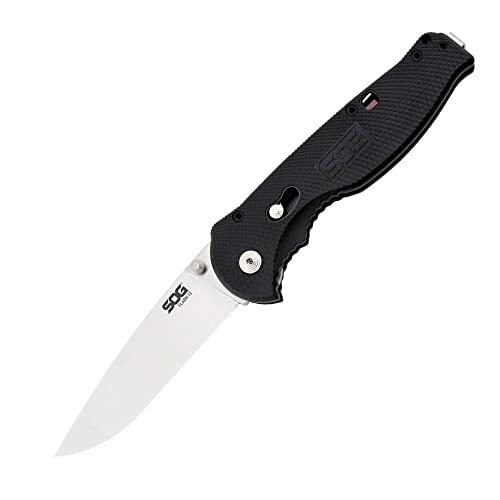 The knife uses the liner lock which is the most secure locking mechanism. Ergonomic handle, despite the lack of traction, still is comfortable to hold. The knife comes with 2 different sizes, provides options for many kinds of people. Comfortable and reliable handling with ergonomic handle. This knife has a very cool look with the Pakka wood handle. The handle embraces the hands with curvy edge and traction for the index finger. This provides comfort and control, indirectly increase knife’s power. The black-coated blade has a straight edge. It is sharp enough for many situations in life. You will be assisted by a spring mechanism when opening the blade. Just press the thumb stud and the blade will automatically get out effortlessly. This is the reason why we choose it as a best EDC knife under $50. If you are looking for a hand tool that to tackle every heavy task in the camping site, you are looking for the wrong product. If you are looking for an alternative piece for one of those in your kitchen knife set, you definitely misunderstand. The main purpose of an EDC knife is to prepare for any unexpected situations that can happen in your daily life. EDC stands for everyday carry. A best EDC knife is a knife that you always keep on your side every day. The knife often has a pocket size and easy to be concealed or drawn. You can hide it in your pocket or belt without feeling any discomfort or inconvenience. Also, you will suffer from no hurt. It should provide comfortable but controlled feeling when holding. The small blade is sharp and tough enough to tackle medium to light duties. The EDC knife is a multi-functional hand tool. It can accomplish all kinds of tasks in everyday situations, such as cutting rope or peeling apples. It is a perfect alternative to specialized tools when they somehow aren’t available. This best EDC pocket knife under $50 is great for self-defense. Its compact size helps in concealing and disguising. It won’t easily show up and attract, or scare, anyone around. The blade won’t easily break because of collision with other weapon, increase your win rate in a fight. Nothing is better than a knife that helps you in daily tasks and saves you in dangerous situations. This is why every person needs to keep an EDC knife in their pocket every day. What to consider when choosing a best EDC knife under $50? 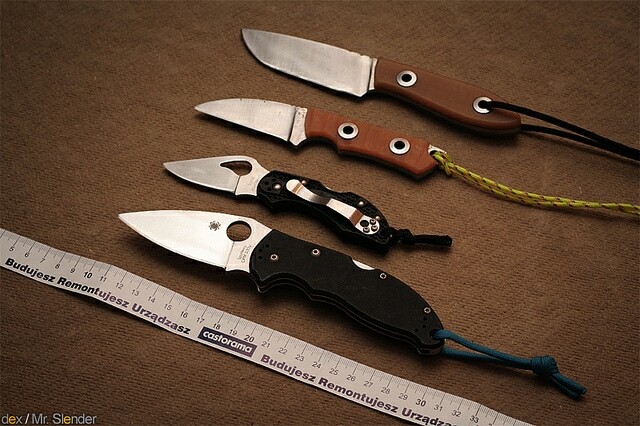 There are 3 main materials that make a best EDC knife, similar to other kinds of knife. They are carbon steel, stainless steel, and high-carbon stainless steel. The only difference here is that, unlike tactical knives or kitchen knives, the best material for an EDC knife is stainless steel. As said, EDC knives are compact and lightweight. Both carbon or high-carbon stainless steel is too heavy. Users will feel uncomfortable and obstructive to consistently carry a heavy knife. Heavier knives are also harder to conceal and store, reduce their effectiveness. Moreover, an EDC knife is mainly used for light tasks, thus such a tough material as high-carbon stainless steel is redundant. A stainless steel blade is durable and reliable enough for an everyday carry item. EDC knives often have better ergonomic design than other types of knife. The handles have a curve shape with finger holds specifically for the thumb and index finger. This design provides comfortable feeling and reliable control. Due to the small size, the knife is easier to slip without these structures. Self-defense and combat are more effective. 99% of EDC knives are folding knives as there is nothing more compact and lightweight. But folding blades are not as strong as fixed ones. Therefore, every folding knife has a locking mechanism. This mechanism locks the blade in place, prevent unintentional releasing or folding. Thus, the knife becomes more powerful and reliable, as well as safer for users. There are 5 locking mechanisms: liner lock, frame lock, Lockback, AXIS lock, and Slipjoint lock. The liner lock is the most common methods while frame lock comes in the second place. AXIS lock is too complex to be operated and user-unfriendly, thus has a lower reputation. 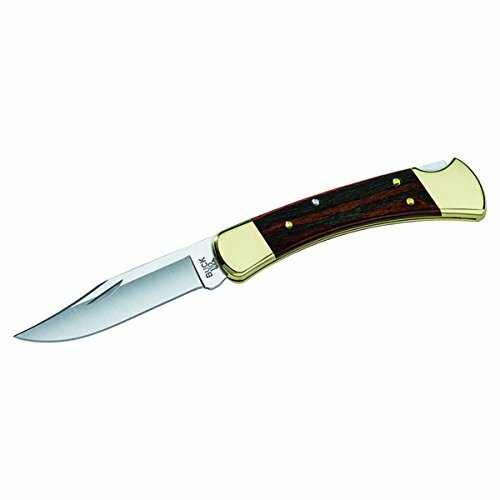 The Lockback mechanism is what you can often see in classic American folding knives and it is considered relatively unsafe. The Slipjoint lock is usually employed in Swiss army knives and is not actually a lock. 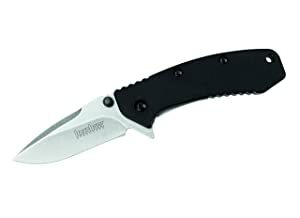 Most of our pick for the best EDC knives under $50 use liner lock mechanism to secure user’s life. Liner locks arguably the best locking mechanism for folding knives. If you look inside the body of a folding knife using liner lock, you will see two liners on the sides. One of them will move inward when you release the blade. Then, the liner will contact to the tail of the blade and keep it always straight and strong. The blade will not return to the original position unless you bend the liner outward. This design makes the liner and the blade to join into one consistent piece of metal. So, it provides the relatively equal level of power as a fixed blade knife. Frame lock is the second secure mechanism. Instead of the liner, knives now use the frame of the handle to lock the blade in opened position. When you pull the blade out of the handle, one of its frames will bend inward. This frame then touches the rear of the blade and block its movement. This design reduces the weight of the knife as it goes off the needs for the two liners. But the fact that two sides of the handle aren’t parallel is discomfort. Moreover, the materials that make the frame aren’t often as solid as those of the liners. So, a frame lock EDC knife isn’t as secure as a liner lock folding knife. Despite the low cost, each pick in our list of best EDC knives under $50 has excellent performance. They are sharp and tough enough to help customers in any unexpected situations. They are also compact and lightweight, increasing convenience and the ability to conceal them. Carry them on your side every day is like having a little but strong guard to protect and help you whenever needed. We hope you can have a good piece in your everyday carry belongings.